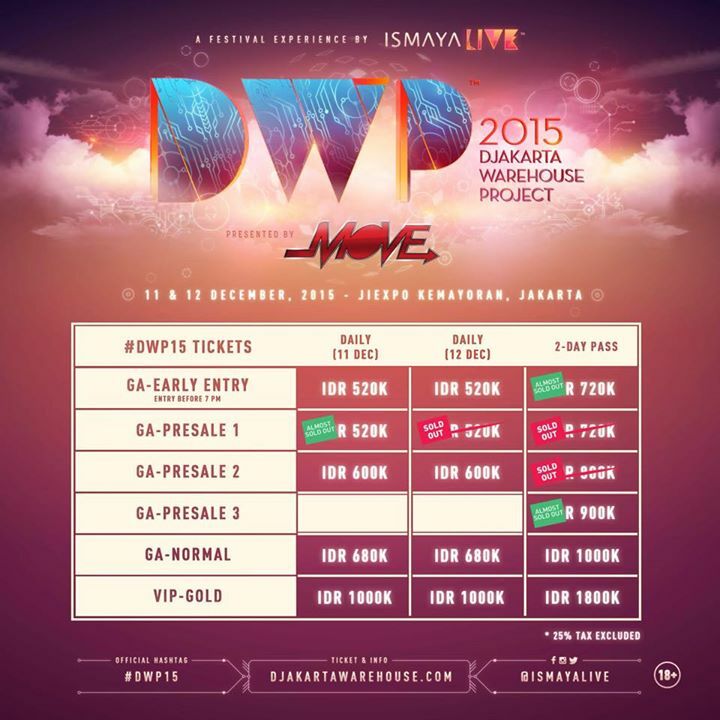 ISMAYA LIVE proudly presents DJAKARTA WAREHOUSE PROJECT 2015! It’s that time of the year again! Showered by the love of 70,000 passionate festival fans last year, universally acknowledged Indonesia’s favorite dance music festival, DJAKARTA WAREHOUSE PROJECT, returns stronger this year. Started from a warehouse space, Djakarta Warehouse Project is cementing its foot as the biggest annual dance music festival in South East Asia with its massive 7th edition of the festival. 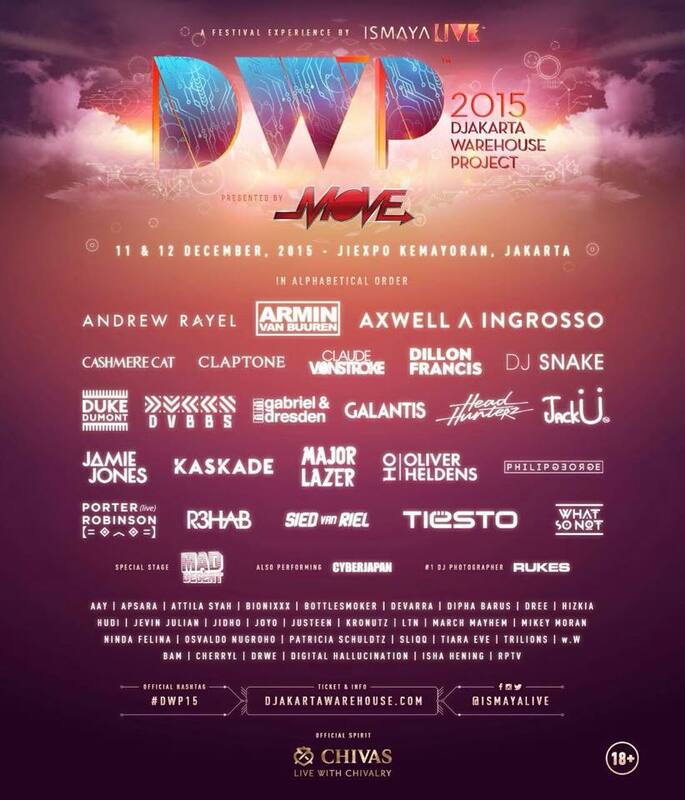 This year, #DWP15 will take place on FRIDAY & SATURDAY, 11TH & 12TH OF DECEMBER 2015. Gearing up to take over Jakarta’s colossal Jiexpo Kemayoran Convention Center for an unforgettable two-night extravaganza this December, is an extraordinary array of some of the best DJs and live acts from around the world, including Armin van Buuren, Axwell ^ Ingrosso, Tiësto, Kaskade, Dillon Francis, Porter Robinson, DJ Snake, Major Lazer, Oliver Heldens, Claude Von Stroke, Jamie Jones, Galantis, Cashmere Cat, R3hab, Claptone and Philip George. Not just that, one of the most well-known record labels in the electronic dance music industry: MAD DECENT will also take a huge slice in the festival as #DWP15 will feature a Special Stage by MAD DECENT. Celebrate, as MAD DECENT Crew including MAJOR LAZER presents you the only festival show in South East Asia. Something you only see in Djakarta Warehouse Project. First up to join an already mind-blowing array of headliners will be the luminary duo Jack Ü, comprised of Mad Decent boss Diplo and OWSLA head honcho Skrillex. The pair have set countless festivals alight since their debut back in 2014 and are guaranteed to bring a host of surprises to DWP during their first ever Asian performance. Furthermore, DWP has also confirmed deep house maestro Duke Dumont, Armada Music favorites Gabriel & Dresden and Andrew Rayel alongside Spinnin’ Records veteran Sied van Riel to bring some different flavors to proceedings. Last, but by no means least, one of the hottest acts to come out of Australia and Future Classic label favorite, What So Not, will be making his DWP debut this year and is bound to be a surefire hit with local and international fans alike. Not to forget, the local heroes. Aay, Apsara, Attila Syah, Bionixxx, Bottlesmoker (Live), Devarra, Dipha Barus, Dree, Hizkia, Hudi, Jevin Julian, Jidho, Joyo, Justeen, Kronutz, LTN, March Mayhem, MC BAM, MC Cheryl, MC Drwe, Mikey Moran, Ninda Felina, Osvaldo Nugroho, Patricia Schuldtz, Sliqq, Tiara Eve, Trilions, Ww, Digital Hallucination, Isha Hening and RPTV are sure to be glimmering around the two magical days of #DWP15.